I first encountered war imagery in textiles when I attended an exhibit called Weavings of War: Fabrics of Memory at the University of Wisconsin’s Design Gallery. I was shocked by the images. Huey helicopters were the focal point of a quilt and bullets formed the borders. Appliquéd bits of red fabric depicted blood spurting from a woman who was shot on a bridge while appliquéd soldiers marched appliquéd peasants through appliquéd rice paddies and corn crops. Rifles repeated in brown patterns looked like trees in a forest. War Imagery in Women’s Textiles: An International Study of Weaving, Knitting, Sewing, Quilting, Rug Making and Other Fabric Arts by Deborah A. Deacon and Paula E. Calvin documents war as subject matter for textiles. The authors, both art historians, review the Western tradition of depicting war in Europe, the US and Canada. In Europe the story starts with embroideries such as the Bayeux Tapestry in the Middle Ages, and includes knitting campaigns during World War I and rugs woven by Bosnian women in the 1990’s. The U.S. story begins with Betsy Ross, sewing flags for the new nation, a product of revolution. For both the US and Canada, the authors explore the work of Native Americans affected by westward expansion and the 20th century wars. Subsequent chapters explore the war textiles of women in Latin America, Asia and the Middle East. In Africa, the authors discovered there is not a tradition of using textiles to express reaction to war. However, African art does incorporate reactions to colonialism. In South Africa, apartheid is remembered through memory cloths. However, neither of these artist traditions contain images of violence. The pieces I saw on exhibit were made by women from Afghanistan, Kashmir, Pakistan, Somalia, Guatemala, and Peru. The textiles depicted civil wars, colonial wars and foreign invasions. There were designs showing men rounding up soldiers, peasants herded off their farms and people shot and left to die, unknown, anonymous pawns in national and international war games. After the soldiers leave, the women do what they have always done: they make quilts and other textiles about what they know. They use the traditional patterns and colors and techniques of their grandmothers to sew planes and bombs and dying peasants. In making the textiles, in recording the horror, the women remember the dead: a sister, a husband, a child, a parent. All people with names and hopes and dreams, who laughed and loved and who were loved, but who have been lost to war. War Imagery in Textiles is thoroughly researched with detailed notes and a lengthy bibliography. There is also a helpful glossary of textile terms. The book necessarily traces the historic development of textiles independent of war imagery. Most of the historical textile artists are anonymous, but each chapter notes the names and biographies of contemporary textile artists. There are some black and white photos that illustrate historical subjects and a collection of color prints of contemporary subjects. An index allows the reader to search for topics of interest. In cutting and stitching, women re-claim themselves in color and texture and story. They sew the past so they can live again. 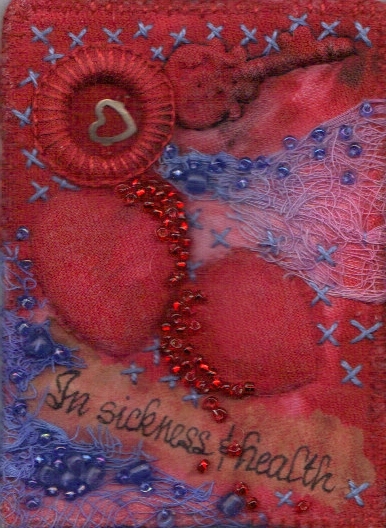 In October I shared in this blog the small art card I designed and stitched to swap with another quilter. The theme was, “What’s in Your Heart,” and a few submissions were selected to appear in the February/March 2013 issue of Quilting Arts magazine. 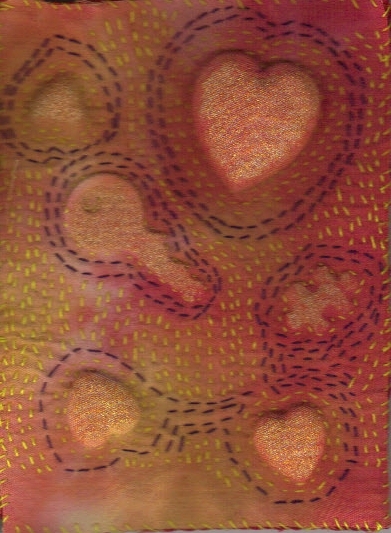 When the issue arrived I looked at the cards selected for the magazine and was especially drawn to one that used a technique similar to the one I chose but to much greater effect. When I got the mail on Saturday, there was a brown envelope and I knew my swap had arrived. And look! It’s the card I had admired so much. I recognized it immediately. The name of the artist and her email were on the back. I discovered she lives four hours south of me in Illinois and is a retired art teacher. Of course. Such a good eye. We did actually swap, so she has the piece I made, but I’m really certain I have the best one! So…since this is a poetry blog, I should say something about poetry. Today was a good day. I wrote two poems when I woke up. One was inspired by friends who are struggling with losses and yet soldier on because there is nothing else to do but keep going. The second poem was in response to the Ellsworth Kelly Prints exhibit that just opened at the Madison Museum of Contemporary Art. I agreed to write a poem to be read at an event in March called, “Distilled from Nature: Poetry and the Works of Ellsworth Kelly.” I had written a funny poem about a conversation between two colors, but after I listened to the curator and the collector discuss their long relationships with Kelly, who is 92, I felt I had to try something more respectful. It came together quite nicely, I think. However, instead of sharing my poems, I am sharing the artwork of a woman I have just “met.” Isn’t it amazing what art can do! 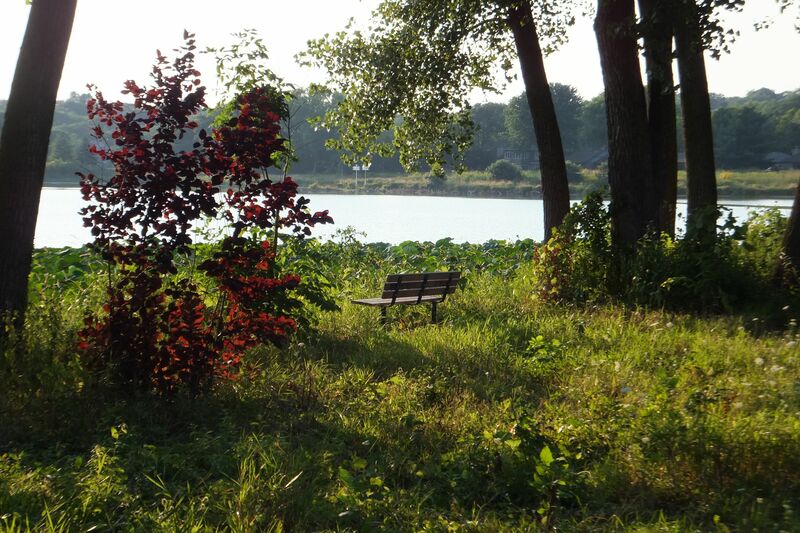 First, the photo is an example of what I do when I am not writing. That’s not to say it’s like doing dishes or changing the sheets. It’s what I do instead of writing. Many, many things fall into this category, but one big bucket is called “fiber arts.” The August/September issue of Quilting Arts magazine offers the opportunity for an Artists Trading Card (ATC) exchange: make one, get one. QA encouraged makers to use ideas from the issue. One woman, Diane Savona, wrote about her work in an article titled, “Under the Surface Embellishment.” She takes found objects, covers them with hand-dyed fiber and stitches them in place. That sounds simpler than it is. I spent probably six hours stitching my little 3 1/2 by 2 1/2 inch piece. Savona’s work is the most unique and inventive I’ve seen in the quilting field. The other thing that has started to occupy my time is ModPo. I heard a segment on NPR at the end of September about a free on-line course in Modern Poetry. The class had started and work in the kitchen was in a state of chaos, so I filed the thought. Yesterday I was perusing NPR’s website and saw a link to Coursera at www.coursera.org There is a schedule of nearly 200 free courses offered by universities all over the country. I signed up for the University of Pennsylvania’s class in Modern and Contemporary American Poetry, taught by Al Filreis. It’s a 10 week class and since I joined late I have not taken exams or written papers, but the site will be up for a year longer for people who enrolled. There are links to discussion videos where Al and seven students discuss poems in detail, plus links to written and audio poems, additional reading, discussion forums, etc., etc. The class starts with Emily Dickenson and Walt Whitman as pre-modernists and starts to trace their influence through the 20th century to today. It’s a great opportunity and … free! You can see from the photo that I am slowly but surely converting bats of wool into yarn. The white ball on the left was my first effort. It’s big and lumpy. The grey to the right was next, followed by the spool in back, which was most consistently spun. The orange and green ball in the middle is actually plied: I spun orange yarn and green yarn separately and then twisted them together into two plies. That ball is ready for knitting but you could knit with the other yarns as well. The small camel-colored ball in front is… camel hair. It’s from the camel hair on the right in back. It’s what we will use to knit the amulet bag. I get a pretty good grade in spinning, but knitting is another matter entirely. I am a very poor knitter and even though I understand it, and I know the stitches, my hands do the wrong thing. Well, I will try. I have to finish spinning the camel hair first. I only have four days to spin, knit and full it (wash it to make it somewhat fluffed up). Better get busy! 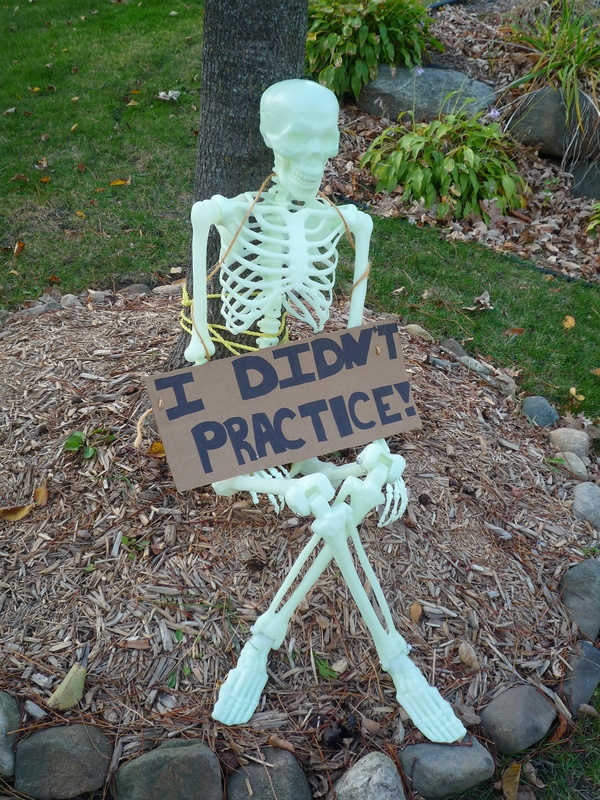 Have you practiced something lately? Apparently, practicing something helps your brain: learn a language, memorize something, try something new. I have been “practicing” writing poems, but as readers know by now, I am easily distracted…and my latest distraction is spinning. No, not the exercise. Spinning as in spinning fiber using a drop spindle. I’m taking a Mini-Class at the Wisconsin Union called “Spin, Knit and Embroider an Amulet Bag,” and the first step is to learn to spin wool. Spinning wool is an ancient art. Or perhaps ancient necessity would be a better term. 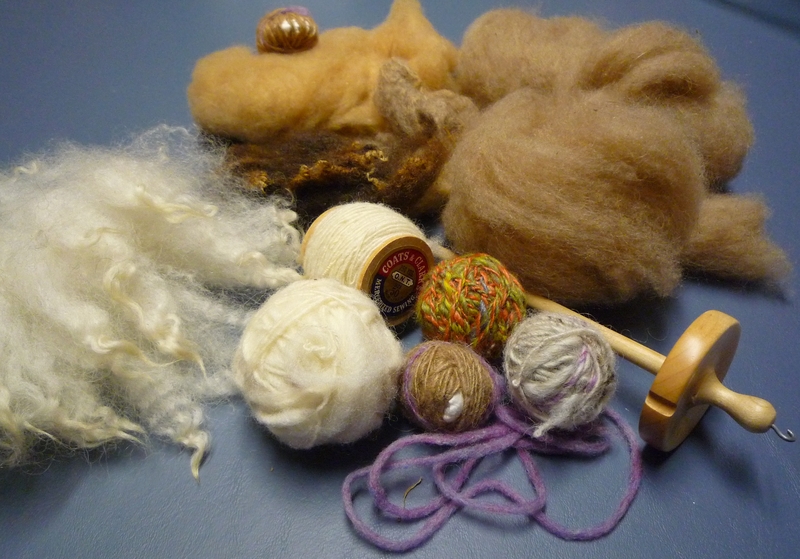 It wasn’t until the middle ages that any technological improvements came into the field of spinning. The idea is to take fibers – wool, cotton, cat hair – and twist them using a spindle to make a thread, rope or yarn that can be used to weave or knit clothing or other textiles. I have been practicing daily and I am improving. However, if my family had to depend on me to clothe them, well, let’s just say for starters we’d have to move to a much warmer climate. Next week we will spin camel hair and knit the amulet bag. What shall I put in it? An amulet bag carries an amulet or charm for protection. I have an amulet bag that I crocheted; I put tokens from my mother, mother-in-law and my dear friend Marian inside. I think the bag I am making now should accompany me on a vision quest: my quest to be a writer.